KSU 4401: Senior Seminar is an eportfolio-centric course assisting college seniors transitioning to post-university life. 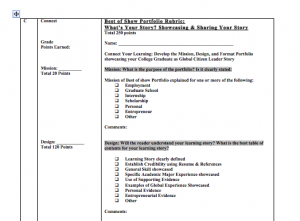 Students develop the life-long learning habit of digitally archiving, assessing, and sharing their learning by creating an eportfolio to honor, understand, and connect their learning from self to global society for the betterment of both. KSU 4401 Senior Seminar is to provide college seniors with an opportunity to reflect on and provide closure to their collegiate educational experience, demonstrate proficiency, develop the skills necessary to successfully transition to and navigate post-university life, understand the civic and social responsibilities of being college educated global citizens and connect with Kennesaw State University in an ongoing alumni relationship. 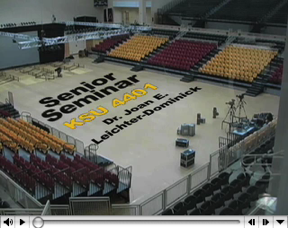 KSU 4401: Senior Seminar is delivered online learning community design to provide college seniors preparing for graduation with a semi-cohort group sharing the experience for preparing for life after college. The coursework is designed in an asynchronistic, which are self-paced with deadlines, and synchronistic, which are in real-time, environment to provide opportunities for learning individually, peer-to-peer, and in community, which reflects their roles career and citizenship. Numbers in italics to right of assignment title refer to corresponding Learning Outcome # (see syllabus). 1. The Complete Graduate Career & Life Vision: Develop career plans for job search, moving up in existing job, starting a business, graduate school and/or whatever you have planned for your career post-university life. This assignment will be discussed during class. 2. Career & Global Citizen Networking: Make a list of networking mentors and contact them in assisting you with your career/global citizenship plans. Mentor may be local, national, international, and/or global citizen. Try a variety of networking strategies such as face-to-face, email, phone, LinkedIn, Facebook, Twitter, etc. Create a business card (paper and/or digital) for networking. 4. Collection of Learning Evidence: (A) Samples of College Work, Professional Work, Volunteer Work, International Experiences, Military Work, etc. : (B) Photos, Videos of College Work, Professional Work, Volunteer Work, International Experiences, Military Work, etc. 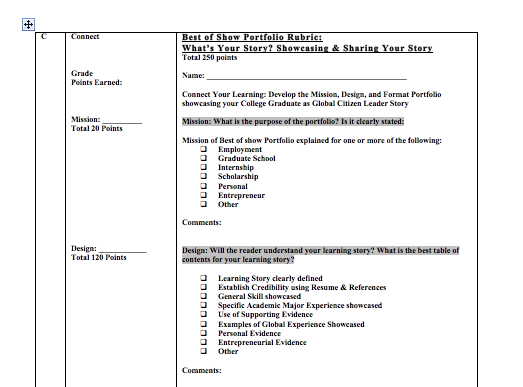 : (C) Narratives of Learning Experiences & Professional Mission Statement. 5. Detailed Storyboard for Best of Show Portfolio: Map out plans for your Best of Show Portfolio. 10 Online Discussions on Web Ct Vista View: Utilizing Learning Modules located on Homepage. C. Best of Show Portfolio – Design, development, and presentation of Portfolio with the choice of a variety of formats from paper, PowerPoint, Website, Web 2.0, etc. Presented in class. Open Book – Objective Test – 25 True/False Questions covering Georgia VIEW Vista Resources, Course Resources, & Activities. Resources, & Activities – Final Exam not cumulative. All course work is due on assigned date. Failure to turn in course work on the scheduled date results in late work worth half credit. Exceptions to this will be handled on a case-by-case basis. 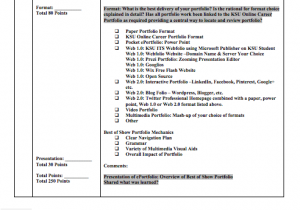 All course assignments are designed to assist you in the successful development of a reflective portfolio and a best of show portfolio, which is a progressive process requiring the layering of assignments resulting in a completed college ePortfolio. For the concise development and success of your reflective and best of show portfolio meeting the course deadlines is essential for your progress. Exams are taken on the days scheduled. Permission to make-up an exam must have the previous approval of the professor before the scheduled exam times. Exceptions to this will be handled on a case-by-case basis. Based on the hybrid course design, it is important to attend the face- to -face classes. Many of the course assignments are due or presented in class, as well as, a list of speakers coming to assist in your preparation for post-university life. Missing more than four classes results in a lowering your grade by a full letter grade. Exceptions to this due to illness, etc. will be handled on a case-by-case basis. As part of the hybrid design of the class, you will be posting 10 discussion questions addressing the learning modules on the course homepage. The purpose is to have you review the course materials pertinent to the learning outcomes for KSU 4401. I have posted the discussion questions for the semester. The discussions are now open through the posted due dates. Dates of discussions are subject to change. Failure to turn in work on the scheduled date results in late work worth half credit .If technical difficulties occur with Vista, you will submit the discussion via KSU email, or bring a paper copy of your discussion to class. This will be decided based on the circumstance. A copy of your discussion questions are posted in the module on the homepage entitled Course Tentative Schedule, Grading Rubrics, & Grading Components. I will have your discussions graded within 10 days of the due date posting. First, you will respond to the posted question, so that I may grade your participation and response for each of the ten discussions. Below, review the discussion boards grading rubric I will use to grade your postings, which are worth 35 points apiece. After your first posting, you are invited to discuss your responses and insights with each other. I will be participating in the discussion as appropriate. I will only be grading your first posting, not your responses to other student’s discussions. Does not make a post during the release time of the assignment. Posting minimally or partially responds to the questions posed, does not stay on the assigned reading topic and has many grammatical and mechanical errors. Posting responds to all the questions and stays on the assigned reading topic but does not show depth or insight. Included one somewhat developed paragraph of analysis. Some grammatical and mechanical errors are present. Posting responds to all the questions, stays on the assigned reading topic and has a depth that shows thought, insight and analysis have taken place. Included one developed paragraph of analysis. Very few grammatical and mechanical errors are present. Posting responds to all the questions, has a depth that shows thought, insight and analysis have taken place and offers new ideas and connections resulting in a thoughtful response to questions. Included one to two developed paragraphs of analysis. No grammatical or mechanical errors are present. Posting responds to all the questions, has a depth that shows thought, insight and analysis have taken place, offers new ideas and connections resulting in a thoughtful response to questions. Included two or more well developed paragraphs of analysis. No grammatical or mechanical errors are present.